It is important to save money in such an unstable economy, but that doesn’t mean that you have to give up on buying new clothing completely. Rather than head to the mall and pay outrageous prices for the clothing that you want, you can always choose to shop at a thrift store instead, or visit the Salvation Army. You’ll be saving money whilst helping your favorite charities, all at once. The common image that comes to many people’s minds when they think of a thrift store is of a small, dingy and dark shop with clothing that went out of style two decades ago. While this is likely in some smaller towns, you will find that most stores now have overstock fashion clothing, which is brand-name clothing that is out of season or excess to local store requirements. You can get this ‘overstock’ at up to 95% off high street prices, depending on where you shop. Also worth mentioning is a relatively new form of thrift store that has sprung up in the last decade or so – the ‘vintage clothing‘ store. These stores specialize in one popular era, such as the 70s, 80s, or earlier. They send their employees to all your local thrift stores on a daily basis to pick out the very best gems, effectively doing all the sorting for you. One trade-off is that you can expect to pay higher prices at these stores, but if you’re short on time, these stores may be the best option for you. In terms of finding the best stuff at regular thrift stores, the key is to make sure that you shop in higher-end thrift stores. Choosing to shop in a wealthy area is a great way to find a Kate Spade or Coach purse for a quarter of the price. It is sometimes worth driving to a neighboring town or into the city to profit from the more wealthy resident’s clearouts. Once you get into the shop, you will find that there are some great bargains on name-brand clothing that is brand new and unworn – some stuff may even still have the tags on! You should also look for discounts that occur throughout the week. Most stores have a sale at least once a week, and use different colored tags to show you which items are on sale. For instance, jeans may be 50% off on Mondays, or footwear may be buy one get one free at the weekends. The announcement for any such sales is usually made at regular intervals over the shop’s PA or sound system. If you are unsure, just ask the cashier. To find the best clothing, you need to be willing to come back to the shop often, at least a couple of times a month. 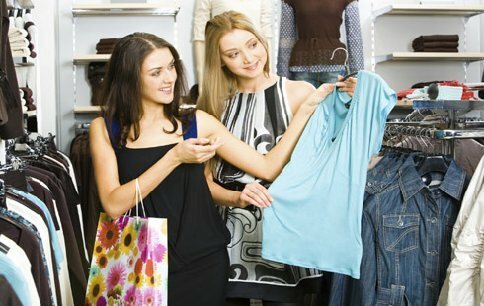 They generally have a high turnover of clothes, and you’ll definitely come across at least one great ‘find’ per visit. Also, if you love thrift store shopping then look into local flea markets, as you can find more unique items, and will even be able to barter.